With more than a billion users, about a third of Internet users, YouTube is the second biggest social media network. Its users rack up billions of views, watching hundreds of millions of hours of video each day. It’s also owned by the biggest search engine in the world, which means being on YouTube can give you an SEO boost and help grow your audience. 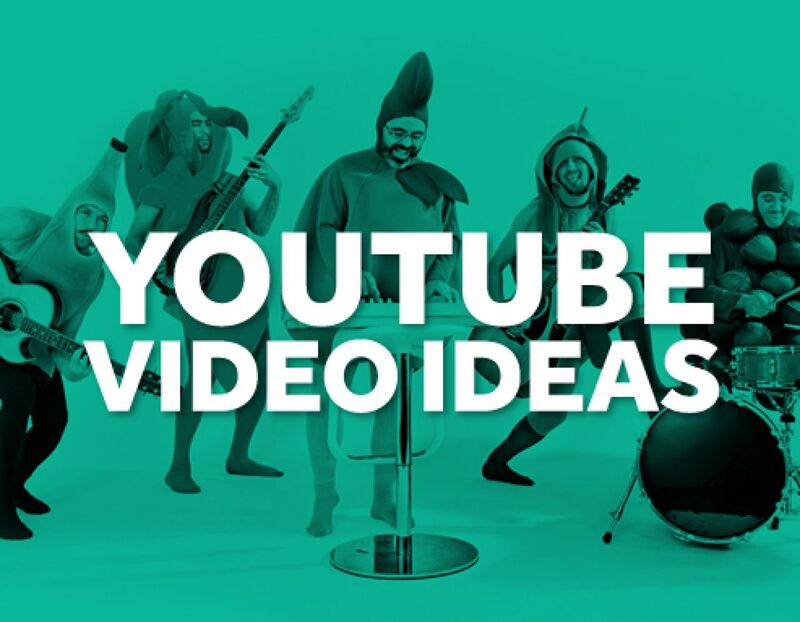 If you’re ready to get started but struggling on what to make YouTube videos about, we’ve compiled a mega-list of popular YouTube video ideas to kickstart your creativity! Make a video introducing yourself. Who are you and what do you do? What can people expect to see on your channel? How often do you post videos? Make a video welcoming people to your channel, and let them know what they can expect. Try to give viewers a compelling reason to hit subscribe. If you’re sharing videos on behalf of a company or nonprofit, make a video introducing your business and what you do. Create a video introducing viewers to the people that make your organization run. Seeing the faces behind your organization or business helps viewers develop a more personal connection with your company. Just like written blogging, vlogging can be educational, entertaining, personal, whatever you’d like to make of it. Both businesses and individuals can use vlog content to engage viewers and grow their audiences. Explainer videos are used to quickly introduce a product, service, company, or app. If your company has one, Youtube is a great place to put it! Let viewers peek behind the scenes with this popular video format. You can show off your room, home, office, neighborhood, or another place you love. YouTubers love walking in another person’s shoes through A Day in the Life videos. Start recording when you wake up in the morning and take viewers through a typical day in your routine. Create a video showcasing your organization’s culture. Ping pong in the office? Team happy hour after work? Videos that highlight a fun and positive culture are a great way to show customers and prospective employees what your business is all about. Show viewers what goes on behind the scenes of your business, event, blog, or YouTube channel. Turn the camera on your friends or family (with their permission of course) and introduce your audience to the people closest to you. Share 50 random facts about yourself. This is a fun way to show your unique personality and for your viewers to get to know you better. Draw My Life videos typically consist of fast-motion illustrations on a whiteboard, with narration by the author about key events and experiences. Are you handy around the house? Love to do crafts? Teach viewers step-by-step how to create your latest DIY project. How-to videos are one of the most popular types of videos on YouTube. They’re particularly popular with tech and beauty YouTubers, but the topic possibilities are really unlimited. From how to play your favorite song on guitar to how to be more confident, if you can teach it, there’s probably someone out there who’s looking to learn it! Walk viewers through preparing a favorite family recipe, teach a cooking or prep technique, or share your favorite cooking tips and tricks. Whether you’re explaining your own product, or just want to teach people how to use a product or app you use and love, a tutorial video is an engaging and useful option for viewers. Share your expertise! Explain a tricky math problem, the theory of relativity, a complex coding problem, or something else related to your industry or area of study. When it’s time to work out, loads of people turn to YouTube, both for how to perform certain exercises, and for guided exercise programs. Yoga, circuit, stretching and form videos are all popular topics. If you’ve given an educational webinar or presentation, put the recording up on YouTube so those who missed it can watch later. Infographics are an engaging and visually appealing way to display facts and statistics that might otherwise be dry or difficult to understand. A whiteboard video is typically an animated video featuring someone drawing on a whiteboard. They’re an engaging way to convey complex ideas and are appealing to viewers. Do people ask questions in the comments of your videos? Maybe your business has some frequently asked questions from customers. Make a video addressing your latest questions or the most commonly asked ones. Are there some common misconceptions that drive you crazy? YouTube is a great venue for setting the facts straight for viewers. Product reviews are amongst the most popular types of content on YouTube. Millions of viewers seek out these informational videos before making a purchase. Tech devices and beauty products are popular subjects, but reviews can be found for all types of products. Seen a good (or not so good) movie lately? Take to YouTube to share your opinion and start arguments with complete strangers. No spoilers! Share your thoughts on your latest read. Gaming videos, including reviews, are hugely popular on YouTube. If you run a business, testimonials should be a part of your video strategy. This type of video provides “social proof” and helps build trust in your company. If you want to go viral, a funny video might just help you get there. Many of the most popular videos on YouTube got that way because they made viewers laugh (and share). If you’re a musician, a music video is an obvious choice. Go high-production value with a theatrical video, or keep it simple with an acoustic track. Just make sure your song is 🔥! From Candid Camera to Punk’d to YouTube, people love prank videos. Play a prank on someone (harmless pranks only, please) and share the results on your channel. Does your baby do adorable things? Your kid’s grandparents aren’t the only ones that would love to see your cute baby videos. Puppies, kittens, baby elephants… the Internet loves cute/funny animal videos even more than videos of human babies. Remember the Ice Bucket Challenge? Planking? Challenge videos are a favorite of Youtubers. Just make sure your challenge is safe! Put your own spin on a popular video, song, or movie with a funny parody video. If you’ve been in the YouTube game any length of time, you’ve probably flubbed some takes. Edit these together for a funny blooper reel your viewers will love. Singing in the car, lip syncing, YouTube loves singing videos. Even late night TV gets in on the fun. Pick a popular song and belt it out! Know the secret to beating that final boss? Video game walkthrough videos are a favorite of YouTube gamers who need a helping hand. So you can beat Super Mario 64 in two minutes flat. Show off your talent on YouTube! Speed-run videos (beating a game as quickly as possible) are a popular genre on YouTube. If you’re an athlete, what better place to show off your skills than on YouTube? Action sports like skateboarding, snowboarding/skiing, and surfing all have active communities where they show off their tricks. Athletes and sports teams will also edit together their best plays for YouTube, both to catch the eye of recruiters or sponsors, and to engage viewers. Time-lapse is a technique where the frames of the video are captured at a much slower speed than usual. The result is often mesmerizing. Traffic, clouds, and the night sky all tend to be popular time-lapse subjects. If you have a theory about what really happened at the end of your favorite movie, YouTube is the perfect place to share your thoughts. A video mashup combines multiple unrelated clips into one new video. Usually funny, mashups can combine two different songs, clips from movies, or any other combination of sources. Have a massive shoe closet? An enviable Lego collection? YouTube videos are a popular way for collectors to share their passion with the world. From the newest iPhone to a trendy subscription box or the hottest toy, people love to watch other people open boxes on YouTube. So next time you get a new product, don’t just rip into it, make sure the camera is rolling first! This genre of video is especially popular with beauty and fashion vloggers. After a trip to the mall, show off your haul piece by piece. 48. What’s In My Bag? 49. What’s On My Phone? No app collection is the same! Take viewers inside your phone to reveal your most essential apps. The internet loves lists. They engage us and keep us watching. What’s going to be #1?? Will my favorite make the list? Countdown your top 10 favorite… anything! Your promo video (you might know it better as an ad) doesn’t have to just live on your website, they can live on YouTube too. A well-done promo video has even have been known to go viral. Share your thoughts on, well, anything. YouTubers use opinion videos to talk about politics, current events, entertainment, celebrity news, movies, and more. Disagree with someone’s opinion video or vlog? Say your piece with a response video. These videos are where YouTubers provide counterpoints to one another, beyond just leaving a comment. A reaction video is different from a response video, in that it’s not a reaction to another video, but a reaction to news or an event. Recap the event your business held, the conference you spoke at, the festival you attended. Event recap videos harness the power of FOMO (fear of missing out) to engage viewers who couldn’t attend. Why wait for the recap to show people what went down? Take your viewers to the event with you by livestreaming to your YouTube channel. The stream is available for viewing even after the event is over. What’s better than making your own videos? Having other people make them for you. A video contest is a great way to get your viewers giving you user-generated content that you can then share on your own channel. Inspired yet? If you have a written blog to complement your YouTube channel, you might also enjoy our ultimate list of blog post ideas. Check out our YouTube tips and learn how to make trailers, intros, and more for your channel! Happy YouTubing!